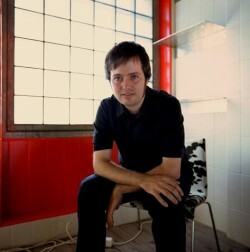 Kid Chocolat is a swiss musician and producer born in Geneva the 26th of March 1974. He’s the founder of Poor Records and PREC Publishing. He’s also a member of The Scribblers and Fortuna. From the beginning, Kid Chocolat know his taste for films. After a first ep dedicated to Peter Sellers, the musician composed a tribute to the italian horror master, Dario Argento. His first album released in 2002 is called « Life And Death Romano Poal » and tell the story of an imaginary musician and producer through the music history. Recently, he tried to make the zombies dance in a funky ballroom with his album « Zombiparti! ». He released in 2008, in collaboration with video artist Pascal Greco, a double feature project including a DVD and an original soundtrack called « Super8° ». If Kid Chocolat loves movies and quotes from the soundtracks by John Barry, Ennio Morricone and Henry Mancini and samples dialogues, he also directed a tribute compilation to the beginnings of Stephan Eicher and Grauzone and regularly collaborates with Asia Argento, daughter of you know who and french comic writer, Luz. It has musical preferences known to the psychedelia, the absurd, black and suspens.